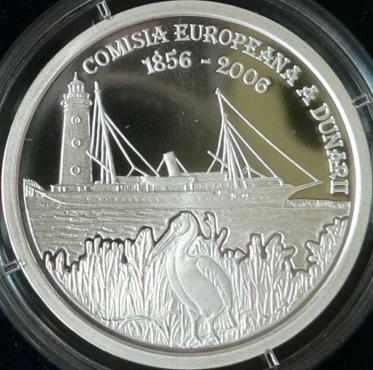 Obverse: year 2006, Romanian coat of arms, ROMANIA, face value 5 LEI, map of Danube Delta Reverse: pelican, Danube River, ship Carolus Primus near Sulina lighthouse, inscription "COMISIA EUROMEANA A DUNARII 1856 - 2006" meaning "EUROPEAN COMMISSION OF THE DANUBE"
The coin celebrates 150 years from the internationalization of the juridical regime of the Danube and from the establisment of the European Commission of the Danube, implicitly celebrating the Paris Peace Treaty of 1856, that ended the Crimean War and included some stipulations favorable to Romanians and to the future Romanian state. In 1853 emperor Nicholas I of Russia demanded to sultan Abdul-Mejid to grant Russia the protectorate over the Orthodox Christians inside the Ottoman Empire. The demand was refused and in October 1853 the war between Rusia and Turkey had already begun, the last being allied with France, Great Britain and the Kingdom of Sardinia. The war was won by the allies, being christened Crimean War after the main operation theatre. The peace conference took place in Paris, in February and March 1856. The Conference of Paris decided that the Romanian Principalities be put under the guarantee of the great European powers, though remaining under Turkish sovereignty. The Russian protectorate was abolished. The organizing of the ad hoc Divans in Moldavia and Walachia was decided also at Paris. These Divans were to decide the future organization and the Union of the Principalities. At the Peace Conference of Paris were decided the freedom of navigation on the Danube, the establishment of the European Commission of the Danube (with the main siege at Galaţi) and the neutrality of Black Sea. Russia was pushed back from Danube for approximately 20 kilometers, and as a consequence the counties of Bolgrad, Cahul and Ismail (southern Basarabia) were retroceded to the principality of Moldavia (the three counties were once again stolen by Russia in 1877). Romania became a member of the Commission with full rights in 1877, after the proclamation of the independence. The town of Galaţi (the second larger town of Moldavia at the time, that had remarkably developed after 1829, the year when the Turkish monopoly over Moldavian exports was abolish, was the seat of the European Commission of the Danube from 1856 till 1948. After the First World War the Commission resumed its activities, going under the name of International Commission of the Danube. In June-August 1948 the Conference of Belgrade created a new Danube Commission, with riverine communist countries as members only: Czechoslovakia, Hungary, Jugoslavia, Romania, Bulgaria, USSR and Ukrainian SSR. The non-riparian countries were excluded, Austria joined the Danube Commission in 1960 and the Federal Republic of Germany refused to participate. The center of the new organization was not at Galaţi anymore but at Budapest. After the fall of the communism the Danube Commission had 11 members: Germany, Austria, Slovakia, Hungary, Croatia, Serbia, Romania, Bulgaria, the Republic of Moldavia, Ukraine and the Russian Federation. The member states are represented in the Commission by ambassadors accredited in Hungary. 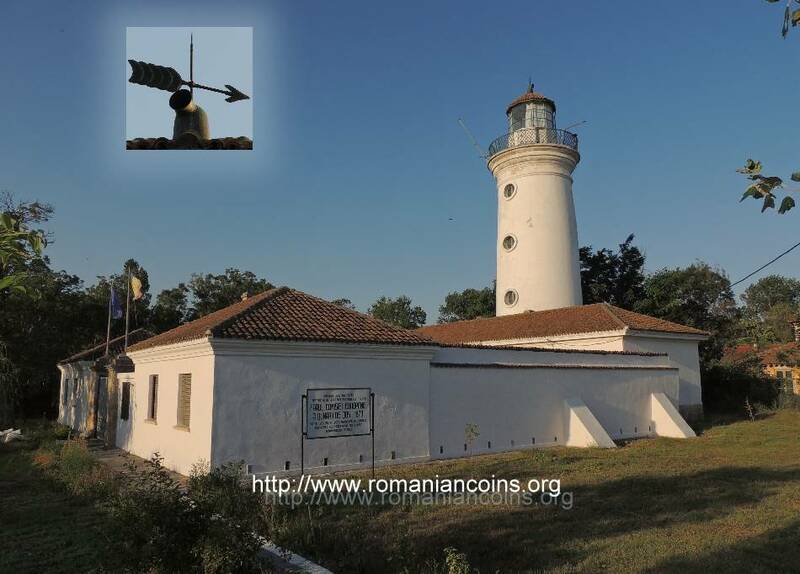 The lighthouse was built on the right bank of the Sulina branch between 1857 and 1870, having been designed by engineers sir Charles Hontley and M. Engelhardt. Built between 1860 and 1868, the Palace was seat to the European Commission of the Danube over to 1921. Nowadays it houses the River Administration of the Lower Danube Galaţi, Waterways Section Sulina, located at the crossroads of Street I and Diuliu Zamfirescu. Both buildings are historical monuments and are protected by the state. 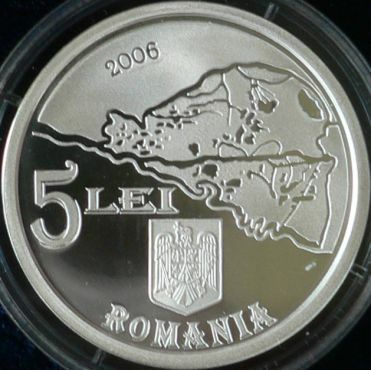 In 2003 the NBR issued a series of three 50 lei silver coins dedicated to the International Year of the Pure Water - Danube Delta Biosphere Reserve. On these coins were presented three species of birds from Danube Delta: pelican, egret and blue kingfisher. 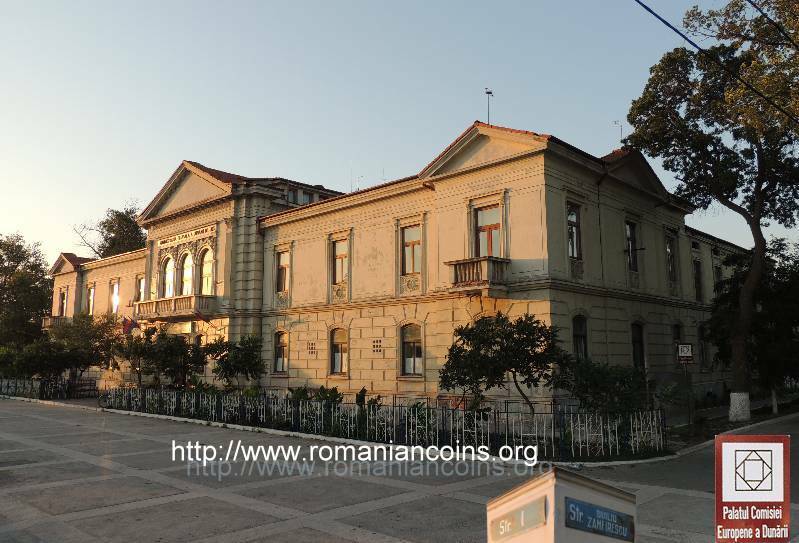 Another (thin) numismatic connection: the Romanian writer Ion Heliade Rădulescu, represented on the bimetallic gold-silver coin of 2000 lei 2002, participated at the Crimean War as officer in the Turkish army, being observed at Varna, in the camp of Fuad-Pasha, by some fellow Romanians.